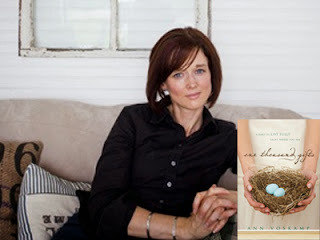 My Second Love: What Do Ann Voskamp, Beth Moore and Sarah Young Have In Common? Ann proclaims "thanksgiving always proceeds the miracle". While this a moving and inspirational thought, it's simply not biblically accurate. Sometimes miracles were distributed by God's wisdom and grace after someone gave Him thanks, but it didn't always happen that way. As with all things, we offer God our thanksgiving, not so we He will perform miracles or give us something that makes us feel bettter about ourselves, but we give to God because He is due all praise, all glory and all worship. Before I conclude my thoughts about Ann Voskamp, I would like to clear up a misunderstanding between her and Tim Challies. Last year in May 2012, Tim Challies, a popular author, blogger and speaker within the Christian Reformed circles, reviewed and warned many about the unbiblical and therefore dangerous aspects of Ann Voskamp's "One Thousand Gifts". Upon receiving an email inviting Challies and his family to dinner at the Voskamp farm, Tim felt remorse over the tone, but not the message, biblical critique or warning of his review. Unfortunately, our brother Tim received a lot of heat from many men and women within the Reformed circles for his apology. Rather than read the apology and clearly discern that he did not retract any biblical stance he took against Ann's book, many felt he sold out to her popularity. I disagree. I think his review and apology were spot on, but don't just take my word for it. You can read both the review and apology for yourself by clicking the links below. Over a decade ago, I took my first Beth Moore study, it was on the tabernacle. I enjoyed it and thought she was a pretty stellar teacher of the Word. I began "following" her work and even attended one of her conferences. But once I began studying the Word of God for myself, and as I listened to her teachings and read more of her work, I began to see some discrepancies between what she says God says and what God actually says in His Word. As time passed, I began to notice that as her popularity rose, so did her arrogance. 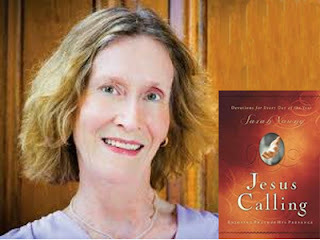 She now presumptuously claims that God gives her extra-biblical revelations. Strangely enough, as I searched to share video clips I once saw, just a few months back, I noticed that all the videos displaying the heresy straight from the horses mouth were all deleted and none but this audio clip can be found: http://youtu.be/op2121d0loE. 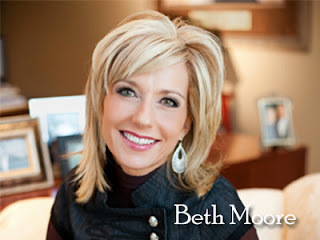 The other danger of Beth Moore is that she not only teaches women, but she also presumes unbiblical authority over men, teaching and preaching to audiences of both genders. As a matter of fact, she was the only female who took the stage along with John Piper and many others at Louie Giglio's most recent Passion Conference in 2012 (which I also do not recommend). All three women give us a sense that we can do something to be holy and to commune more intimately with God—elevating a person's sense of accomplishment rather than humbling us and bringing us to our knees with utter gratitude and indebtedness for all the Father has given to us in His Son Jesus Christ alone.